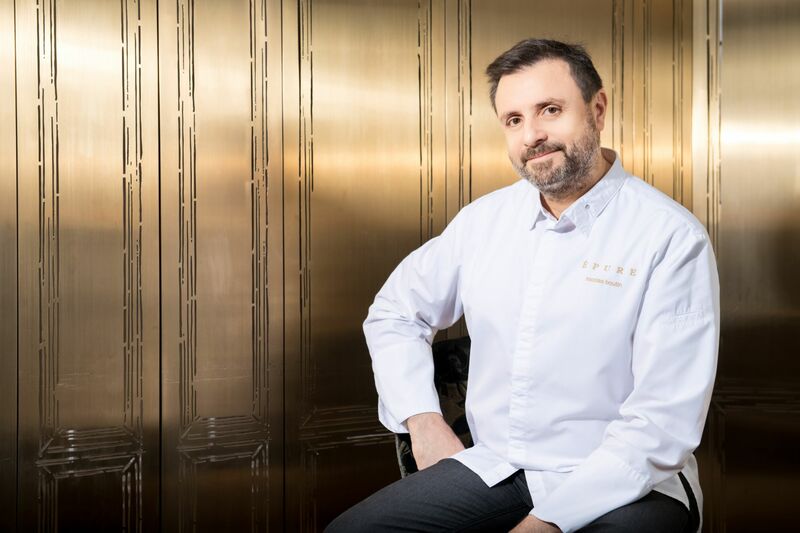 For chef Nicolas Boutin of Michelin-star restaurant Épure, life is about taking the simple things and making them shine—whether it's using beautiful ingredients in his restaurant, finding fun and humour in every situation or enjoying a lazy day at home. Tell us a bit about you and what you do. I have been in the industry for 33 years, first learning the fundamentals of French cuisine in some great restaurants in France. I then began to travel the world, starting with Ireland where I learned English and had the opportunity to open my own cafe and boutique business before moving into the luxury hotel industry. This took me from the Caribbean to Hong Kong, Boston, Maldives and then French Polynesia before finally coming back to Hong Kong to open Épure. Obviously food. I started cooking as a job but became passionate about it after a while. When I have time off, I like to travel to keep learning and to experience local cuisines around the world. Someone you look up to? Coluche. He was a pragmatic French comedian and actor who was famous for his irreverent sense of humour. The one thing you can’t live without? The lemon. It can lighten a dish, cut through richness and add distinctive brightness. On the flip side, what is one thing you could do or have less of in order to improve your life? How do you find balance in busy Hong Kong? The beauty is that most things in Hong Kong are very organised and easy to do including administration, transport etc..which makes it easy for you to find time to find your own "cocoon". What are some of your self-care rituals (when it comes to beauty & skincare)? I might not be an expert in skincare products, but I believe in "you are what you eat". A balanced diet will result in good health and good skin. I know that collagen intake can replenish the collagen we naturally lose as we age, and keep our skin bouncy to maintain a youthful complexion. Honestly, usually kind of lazy, especially since I only have an average of one day off per week. I like to just relax at home. Why do you believe it’s important to take some time out for yourself? I believe is important to step back (French expression, 'a tête dans le guidon' 'the head in the bike handlebars') to be able to see what is working and what can be improved in order to keep the job as enjoyable for me, and for the team around me as well. What are some of the simple things in life that you enjoy? Cooking at home and watching movies. What does the term “less is more” mean to you? Fresh ingredients (no chemical preservatives), simple flavours (simplicity)—clean, natural, straightforward. Eating isn't just about satisfying hunger. Everything you eat becomes a part of not only your inner being but the outer fabric of your body as well. Michelin-star chef Nicolas' long working hours may attribute to accelerated loss of collagen. A bottle of Tense Up each day is a hassle-free solution to replenish collagen from within. With the Dynamic Fat Burner, the chef can stay worry-free when he has to do regular tasting to develop his next yummy dish. The ‘Less Is More’ series is brought to you by FANCL, the industry pioneer of preservative-free skincare. With two state-of-the-art research and development facilities in Japan, FANCL is the only skincare brand that offers science-backed skincare products and health supplements that are completely free of harmful preservatives, resulting in long-lasting beauty, inside and out.